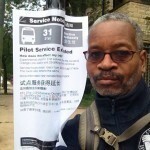 I thought it might be helpful to start a generic thread, considering the possibility that the CTA Bus Shuffle could be continuing for a while. Since the high 1500s started arriving at 74th, it looks as if at least five 6000s from 74th have found a new home at The Glen: 6197 & 6199-6202. Installment 1 of ???? ! Here are my predictions on the NF's and this is PURELY SPECULATION! -Once all 4000's are delivered, there will be a shuffle amongst those. - 6 to have 1580-1620, 1725-1750, plus what they have from the original 9/08 transfer from K and C.
- K to keep what they have, and get 1621-1629 odds from P.
- 7 will loose 1927-1977 odds to P, but keep the balance of what they have, and pick up some early 1300s from C.
when did the 6197,6199-6202 leave 74th?have you seen them on bus tracker or in person on a F route? This was probably a borrowed bus for the day, but bus #1239 (from 77th Garage) was operating the 74 Fullerton route today. All five appeared on Bus Tracker during this evening's rush hour. They must have been transferred very recently in sync with the arrival of the high 1500s at 74th. When the NABIs were sidelined, Archer, Chicago Ave., 74th, and Forest Glen each gave up a dozen or more buses to the four garages left short by the NABI crisis. As new 2000s and 4000s continue to arrive, it looks to me as if the focus is on restoring each garage fleet to its pre-crisis size. Again, if I were putting money (as I lost on 970-999 and Clipper Fund) it would be on no BRT. There was a discussion on the CTA Tattler on "getting money without eating the bug" and the CTA got the bus part of the money in the stimulus plan without the conditions. There hasn't been any word whether the City Council passed the parking tax part of the BRT plan, and it is questionable whether the city is that interested in the street furniture or eliminating parking, say, in Greektown. Now, if we only knew if the number was 58, 55, or 52. As far as speculation on bus swaps, CTA has acted so irrationally (in the sense of just moving them despite any rationale), that I wouldn't go there. The only thing I note, is that with the sighted deliveries up to 4114, CTA is back to the point it was with 7300-7414, the main change being fewer on the south side to enable currently covering 156. It looks as if there have been a few minor roster moves over the past few days; no hint of swapping as far as I know. 103rd gave up three buses: 1550 to 77th, 1584 & 1586 to 74th. It looks as if 1549 & 1550 are setting the table for the eventual assignment of 1549-1579 to 77th (educated guess). In the meantime, North Park has sent 1549 to 77th, and 1599 & 1601 to 74th --- which could end up with 1580-1629 (again, just an educated guess). It looks as if, for now anyway, the focus is on relieving shortages at the garages that sent buses to the barns with sidelined NABIs. Anyway, probably several more swaps coming up the pike too, considering the remaining odd-even distributions. I wouldn't be surprised to see at least a couple more garages get 6000s either. I saw 1624 on #82 Kimball-Homan yesterday, so that might mean something else, unless it was just a bus filling in for a NABI. 1624 was transfered from 103rd a while ago along with 1622, 1626, and 1628. We've wondered why CTA has been moving buses. Aside from consolidating manufacturers at a particular garage, has anyone considered the elements of vehicle age/mileage and number of seats/capacity. Is CTA attempting to reach targets related to these items? Oh ok. I didn't have any idea about that, so thanks for letting me know . More bus moves news: I spotted 1968 on #155 Devon this morning at Devon and California. 4102 and 4061 are on the #22 right now. It appears that P is sending more 4000's out to K and 77th. 4027 was on the 156 and 4037 was on the 6. I Saw NF 4033 and 4039 on #6 on bustracker just now. 4033, 4034, 4036, 4037, 4039, and 4080 are all on the 6 now. According to the B.O.B.A.R., 77th is receiving 4033-4041 for the route #6. Not sure if they will receive more as we still are pending on the last 4 artics. im assuming odds and evens? 1850-1854: 103rd to North Park (the odd ones had just recently made the migration in reverse). 6068-6070, 6072-6077, & 6079-6080: Chicago to Forest Glen. So, we have already had artics that started at 103rd, then went to 77th, then 77th lost them, now 77th has some artics back, all in about 2 months. Also, the reports that some buses are delivered to 103rd, just to send them to Chicago a couple of days later. At least that should stop in a week (unless bus 2030 is on the way). Even given understandable scrambling because of the NABI debacle, I agree with trainman that this is too much. However, I'm sure that our bus driver members are glad to get the OT. Is that the real function, as most of these buses are now fungible? I can see a small shuffle after the NABI's left service but I agree...this is out of control. Im sure they can help close the $53.7M deficit by STOPPING ALL OF THIS. 4047 and 4049 From North Park to 103rd as well.